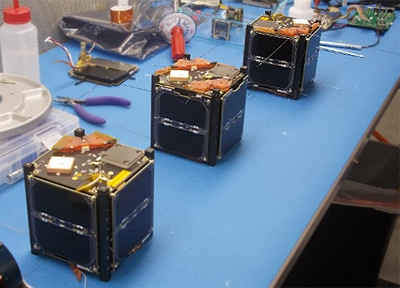 The PropCube (Propagation CubeSat) series of 1U CubeSats are ionospheric research satellites to measure artificial ionization. The satellites were developed by the Naval Postgraduate School (NPS) and provided by Tyvak Nano-Satellite Systems Inc. The cubesats are performing dual frequency ionospheric calibration measurements of ionospheric electron density and irregularities. They performing measurements of total electron content by differential group delay, of plasma irregularities by amplitude and phase scintillations and detection of artificial ionization and irregularities generated by the HAARP, Arecibo and Sura high frequency facilities. PropCube 1 (Fauna) and PropCube 3 (Merryweather) were launched together into a 63° orbit, while PropCube 2 (Fauna) was to be in high inclination orbit, but was instead launched into a 51° orbit.